The research report by Persistence Market Research on the global agriculture micronutrients market offers in-depth analysis and forecast on the global market and insights on the market on the basis of segments and regions that support decision making process and helps in planning strategies in order to remain competitive in the global market for agriculture micronutrients. The report also sheds light on the future of the market for the forecast period 2017-2024. Forecasts along with the changing market across all the major regions has been given in the report. The global agriculture micronutrients market report focuses on all the key opportunities, latest trends, drivers, micro and macro-economic factors, and challenges that are expected to impact the growth of the global market for agriculture micronutrients. Analysis of all the factors across major regions are given in the report. The report helps readers to gain insights on all the important factors on the market growth during the forecast period 2017-2024. The report also focuses on all the key segments and regions to identify opportunities. The qualitative and quantitative data presented in this report is offered in the report with the help of extensive research process. Weighted average model of the global agriculture micronutrients market is provided by a comprehensive research methodology including primary and secondary research. Secondary research helps in understanding the overall market and the primary research helps in understanding the current scenario in the market. The data collected through secondary research is analyzed and validated, similarly, data collected through primary research is also cross-checked with available data sources. This helps in accurately identifying opportunities in the market. This process is done to obtain accurate data on all the segments and regions in the market. The data obtained from various source is triangulated to provide a better forecast with estimated numbers. The global market for agriculture micronutrients is segmented on the basis of product type, application, crop type, and region. The key segments are further divided into sub-segments and all the key regions are segmented into countries. The report on the global agriculture micronutrients market offers a complete package including leading players in the global market. Latest product development by all the major players, new business overview, product portfolio, financial overview, market share, revenue through sales, partnerships and mergers and acquisitions has also been included in the report. Moreover, Porter’s five force analysis, SWOT analysis, and market attractiveness analysis are also included in the report. All the information given in the report help to identify better opportunities for growth. Decisions making is an essential part of the business and the information provided in the report including trends, current market scenario helps in taking a decision. 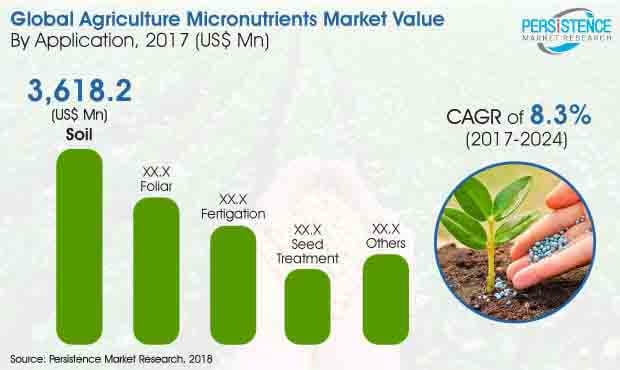 The report on the global agriculture micronutrients market include the opinions offered by manufacturers, and suppliers operating in the global market for agriculture micronutrients. The market attractiveness index is also provided in the report to help in identifying all the growth opportunities in the market. Micronutrients such as copper, iron, zinc, boron are considered as essential micronutrients for plants. As the deficiency of micronutrients can lead to various diseases in plants that may reduce quality and quantity of plants. Increasing preference for Genetically Modified (GM) seeds across the globe is also likely to impact the growth of the global market for agriculture micronutrients. Increasing use of chemical fertilizer is also driving the growth of micronutrients, as it protects crops from insects, UV radiations, and also offer increased yield. The demand for zinc is growing across various regions especially in the Asia Pacific. Owing to the deficiency of zinc in soil, the productivity of agricultural crop is decreasing. Hence, increasing number of companies are focusing on providing zinc as micronutrient for agricultural crops. However, factors such as extensive irrigation facilities, mining of micronutrient reserves and increasing use of high chemical fertilizers are resulting in the global shortage of micronutrients. Meanwhile, competition among the key players in the global agriculture micronutrients market is also increasing. The key market players are competing on the basis of pricing, technology, and quality of micronutrients. As per the report by Persistence Market Research (PMR), the global market for agriculture micronutrients is anticipated to see a significant growth during the forecast period from 2017 to 2024. The global agriculture micronutrients market is also estimated to reach US$ 13,344.2 Million revenue by 2024 end. Compared to the various application of agriculture micronutrients in seed treatment, foliar, fertigation, it is expected to find the largest application in soil. Declining nutrients in soil is resulting in the use and growing demand for micronutrients. The soil is an essential part of agriculture, hence, micronutrients are used on a large scale to provide a proper balance of nutrients for yield and normal growth. Foliar sprays are also used on a large scale to apply micronutrients. It has also been found that the effect of applied nutrients with foliar spray is immediate. Moreover, recommended application rate has also been set for various micronutrients. Different types of agriculture micronutrients are used for various purpose on crops, vegetables, and fruits. Iron, manganese, and copper have different effects on crop. However, zinc as agriculture micronutrient is expected to gain popularity in the coming years, owing to the increasing number of benefits offered and the rise in deficiency of zinc in soil across various regions and countries. However, the application rate of zinc differs, depending on the requirement of zinc in the soil for agriculture. Increasing demand and consumption of cereals across the globe is driving the use of micronutrients in cereals. Tests are also being conducted to find various symptoms for deficiency of iron, copper, and zinc in cereals. Hence, the demand for agriculture micronutrients also depends on the type of deficiency found in the crops, oilseeds, pulses, cereals, etc. Moreover, new methods of applying micronutrients are being adopted to increase the benefits of micronutrients and result in better quality of crops. Auriga Industries A/S, BASF SE. E. I. DUPONT DE NEMOURS AND COMPANY.